Alaska has not adopted or made available a definition of college and career readiness. 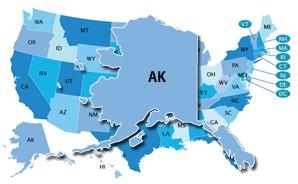 Alaska does not have state policy in place that allows students to earn dual credit, although dual credit is offered on an institutional basis (Education Commission of the States, 2015). The Center for Native Education has partnered with an institution of higher education to provide one early college high school program as part of the Early College High School Initiative (ECHSI). More information about schools participating in ECHSI is available at the ECHSI website. In 2010, Alaska mandated that all students in Grades 6–12 have a Personal Learning and Career Plan (PLCP) (U.S. Department of Labor, 2013). The Alaska Commission on Postsecondary Education and the Alaska Department of Labor and Workforce Development have partnered to create a state resource on career planning available to all Alaska residents. PLCPs are designed to be used in student conferences to help students, educators, and family members keep track of student academic and career goals and needs. PLPCs are to be updated annually. Alaska may have a state-specific Early Warning System, but the system is not publicly available.